To find 30 different Southern Ontario bicycling route map loops from West Toronto to Niagara-on-the-Lake in the Southern Ontario area, check out the book “THE CYCLING ROUTE BOOK, BOOK ONE – Revised 2009’ by Christine Whitlock. This cycling book follows the waterfront trails as close as possible to Lake Ontario then looping back through residential areas. Each Ontario bicycling map starts and finishes at a parking area for easy unloading and loading. In the Niagara area, “THE CYCLING ROUTE BOOK, BOOK ONE – Revised 2009’ has six bicycling loops going to 41 Wineries where you can stop, rest, taste, and buy locally grown and produced world-class wines. There is even room in the book to make wine notes. The Ontario bicycling book gives the difficulty, distance and road directions for each cycling map. 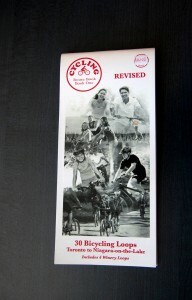 Different bicycling maps are suitable for beginner and family, intermediate and expert cyclists. Connect the cycling loops to make longer rides. You can walk or roller blade many of the routes – even cross country ski or snowshoe in winter. The cycling book routes/maps goes through Etobicoke, Mississauga, Oakville, Burlington, Hamilton, Stoney Creek, Grimsby, Town of Lincoln, St. Catharines, Beamsville, Vineland, and Niagara-on-the-Lake. Cycling clothing, equipment and safety tips are also included. The Ontario bicycling book is 8 1/2″ by 3 3/4″ wide, 48 pages, flips up, printed on white stock with black ink and highlighted in red ink. Only $15.00 plus $3.00 shipping (taxes included). Also, THE HAMILTON STORE, 165 James Street North Hamilton, Ontario L8R 2K9, info@thehamiltonstore.ca 905-973-2932 – open late on James Street Art Crawls – the second Friday of the month and SuperCrawl. To get on our list for cycling updates and events, please email cycling@cjcpinc.com.